Ok. Overall nice level. I got to the bit with the girl but gave up as that dissolve bit was hard lol. Speaking of hard i'm making Kaizo Viridian! You only have to jump once there, and wait for the right moment. If you know how to do it it's really easy! Thanks a lot for all the comments, and I'm gonna try your level as soon as it's finished! Good luck. . Some bits are almost impossible but some bits are easy. I'm not going to start the story driven level i have planned until i know how to script fully . Chapter 4 is done! I put a lot of work in it, so I hope it´s good enough! Now working on the big and epic* final chapter, Chapter 5! *actually one screen smaller than the other chapters. This is great!! A charming little story, and good gameplay to boot; kinda challenging at some parts, but nothing too tough. The cutscenes are extremely amusing, and I liked the part where you removed the spikes after getting the trinket. Found one RAE (Room Alignment Error) in the Mario chapter, attached. You can bounce far enough down to go in the walls. Status: Finished the version with 3 chapters. Completed chapter 4! Your story is becoming very intriguing. 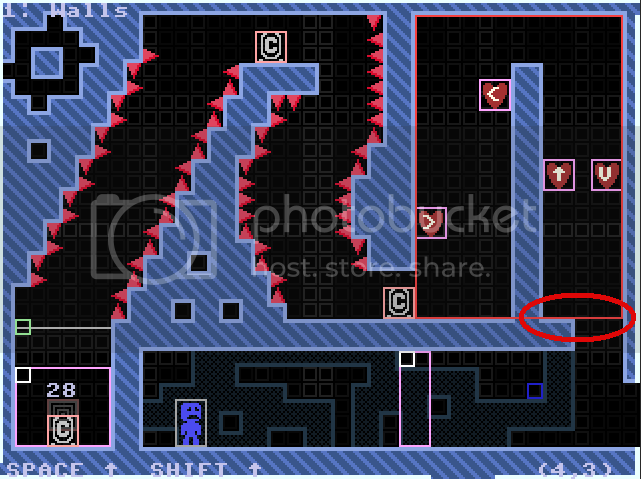 This one was harder, I think a couple more save points would be nice, at least in the beginning of every room (this is not the case in only one or two rooms). EDIT: Terry should totally feature this when it's done. Some weird thing happened in chapter 1 for me where the gravity lines just disappeared without me getting the trinket. I ended up getting it anyways, but you might wanna look into that. I'll try and fix the Error as soon as possible! Thanks again, I thought I had placed a save point in every room, but I'll take another look and maybe add some new ones. I'll get chapter 5 done today! I thought I had fixed that already... but I'll take another look and see if I can reconstruct the bug! Finally, Chapter 5 is done! And because this was the final chapter, the story is complete now! The bounding boxes for platforms/enemies aren't exact, and when you put them against walls, the enemy hits the wall before the edge of the box. Here, since one hits the edge and one doesn't, get bounce at different times. When I finally got over there, they were misaligned and I had no way of getting through, so I had to wait. I removed the little wall there, so it should be alright now! By the way, did you enjoy playing it? Yeah, it was fun, and the whole story thing is a new spin. The chapter select screen is also a neat idea, I liked that. Very nice level. Not too hard, not too easy.